Today marks almost one week to the day since I returned from New Orleans. This city dazzles in necklaces of gaudy indescribable beauty as a lady who sips Pimm’s Cups and watches the sudden rains wash Bourbon Street clean of guilt and grime. NOLA is a woman who has seen the world–the best and the worst of human nature–and her veins run thick with Southern history. She was the one American city I was dying to go and having met her, I wouldn’t say she was American at all, but a country and a force onto herself. And so, it seems only natural that our small band of college friends would reunite, for the first time in exactly a year, to celebrate the joys of living in a city that cerebrates life itself. I don’t know if I will ever again experience a trip with friends that was so complete in all aspects of the journey, a trip so full I suffered from almost no moments of regret. Each day since I’ve tried to put my finger on exactly what caused so much joy and the only thing I can see is New Orleans herself, the beautiful combination of people, music, food and culture all falling into place. Street performers attracted crowds for daring juggling acts and magic shows. Restaurants with white table clothes and strict dress codes shared the same street as strip clubs with flashing neon lights and smiling girls. Live music shook and tickled the air: marching bands paraded on the street, lonely guitarists asked for tips, full jazz bands played late into the evening. Beer was cheap and people of all ages, shapes and sizes carried their filled plastic cups throughout the city looking for the next adventure. The locals talked to the bachelorette parties and the tourists found the local cafes. Anything seemed possible. I couldn’t stop marveling at the attention to detail. The musicians took such time in their riffs and their harmonies. Each house with a balcony had ironwork that deserved a photograph and a sigh. And the Mardi Gras floats. 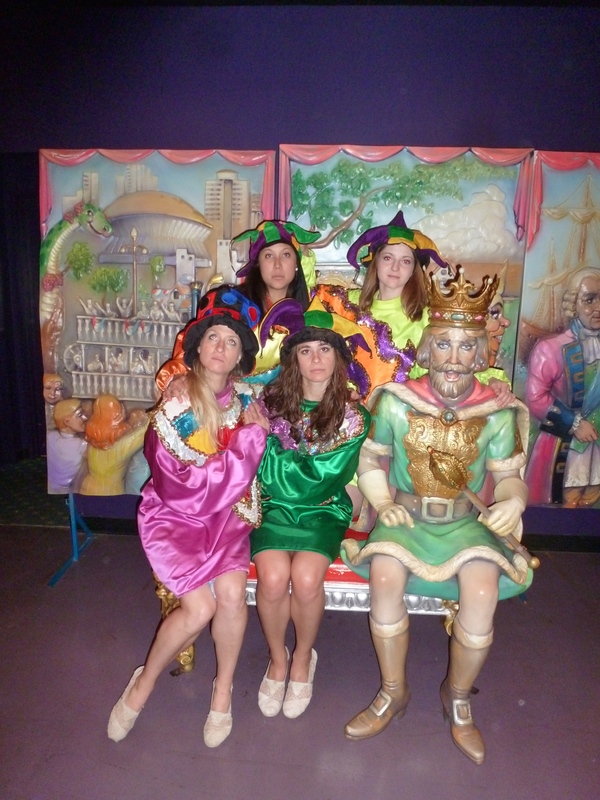 On our first morning we took a tour of Mardi Gras World and saw the floats that are designed, created, and decorated each year for the special celebration. We learned the history behind the crews, who gets to ride on the floats and how they get to stay up there so long (hidden bathrooms on board). The artists worked full time, all year round to get their creations ready for the debut. In a world of tradition, being the best seemed like destiny. The weather was beautiful. Most days were hot and sticky but the temperature and humidity didn’t seem to bother anyone. Every day was a party no matter if the sun was shining or your face was slick with sweat. Just a couple minutes south, the Mississippi River wended slow, a muddy body of water that threatened the city like a sleeping snake. Our hotel on Royal St. was just a block east of Canal St. where the streetcar ran and one block south of Bourbon St. where the nightly debauchery would take place. It felt like we were at the center of a churning, boiling fabulous world. I’ve only just sent the scene. And I haven’t even mentioned the food or the drink or the night I played a small tuba in a crowded bar. All to come. 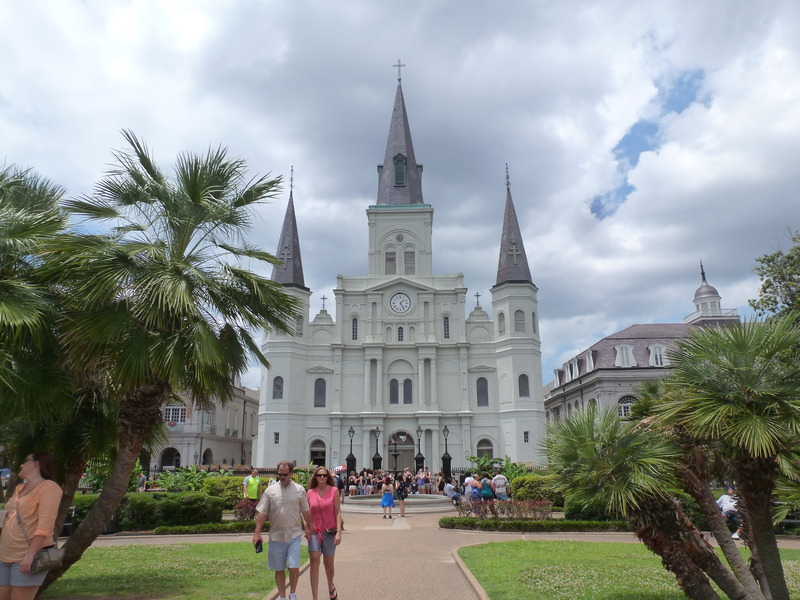 Just know that if you have not yet had the chance to visit New Orleans in the last week, it’s about time you go. Around 8:30am on Saturday morning, I received a phone call and subsequent text from a student at West Chester University. “We’re sorry,” she said “but one of our drivers is worried about black ice so we will be unable to attend the retreat.” Despite my best efforts to convince her the weather would be fine, sunny in fact, I knew my encouragement was a lost cause. This phone call was the final note in a weeklong symphony of cancellations, apologetic e-mails, and last minute scheduling issues. When all was said and done students from Dickinson, Lycoming, West Chester, and Franklin & Marshall had cancelled just days before inaugural Student Environmental Retreat was supposed to take place. I was depressed. Josh Hooper, the executive director of the Pennsylvania Environmental Resource Consortium (PERC), was extremely sympathetic over the phone. He had heard about the event just a week before the actual date and wished PERC could have helped to advertise and publicize the event. To my surprise, after our conversation he did in fact put up a description of the event on the main page. HIs enthusiasm and support of my idea helped lessen the blow of the ever decreasing number of participants. I promised, should the event not be canceled, that we would speak again on ways this event could occur in the future. In total, we had 11 students and 3 faculty participate from Bucknell University, Susquehanna University, and Gettysburg University. I cannot thank these individuals enough for providing the retreat with positive energy, innovation ideas, and overall support throughout our time together. I also want to thank Erika Staaf, Bucknell alum and PennEnvironment employee, who drove 3 hours in the snow to present an informational workshop on campaigning and volunteer retainment strategies as the wrap up discussion on Saturday night. Without each of these wonderful participants, I know the success of the event would be minimal at best. At night, when the Gettysburg students and myself were sitting in front of the fireplace making s’mores, I remember feeling incredibly lucky that such a kind and intelligent group was willing to partake in my crazy event. The conversation was organized into various environmental topics: recycling, food, economic funding, green roofs/gardens, housing options and community initiatives. Each of the schools had a program in a couple categories and we spent the majority of the time presenting our ideas and discussing the feasibility of such projects on other college campuses. Gettysburg has two theme-houses, Farmhouse and Local Lovin’, that work to include sustainability and a connection to their local community through shared living. Susquehanna had its own Sustainability Committee and sub-committee with students creating and implementing various projects on campus. Bucknell students discussed the green roof, native plant garden, and campus-wide recycling audit. And these are only a handful of the numerous projects presented. Each student and faculty member had her hand in one or two new and exciting initiatives that other schools wanted to try out. We also found that members at Susquehanna and Gettysburg faced similar challenges to those at Bucknell. Participants commented on feelings of apathy and lack of interest from their campus as a whole, both in the student body and administration. Not all members of Facilities, Dining, and the University administration were always as open to policy changes in the name of sustainability. Katherine Straub, a professor at Susquehanna, spoke about the feeling of deprivation she believes many individuals fear when they hear about environmental projects. They don’t want to be cold (turning down thermostat), stuck in the dark (conserving energy), and smelly (taking shorter showers). For the student groups on campus, a lack of commitment and dedication was a common theme. One Gettysburg student said, “There’s this bubble of environmentally aware people on campus. How can we pop this bubble?” This is a major part of the environmental debate. The majority of environmentally aware individuals are not radical hippies or angst-ridden vegan organic farmers. Most of us just want the general population to understand their relationship to the earth and take a moment to ponder the impact each of us will leave behind. The call for increased awareness and appreciation of our world is a celebrate of ourselves not a confinement of human rights and basic necessities. Sometimes all you need is human confirmation that your fight is not yours alone but a larger presence fought by others, unknown to you. Environmental battles or not, I think each of us can relate to the encouragement found when a stranger confirms what you know to be true. That your fight is worthwhile after all. The final report will be posted on Scribd in 1-2 weeks. 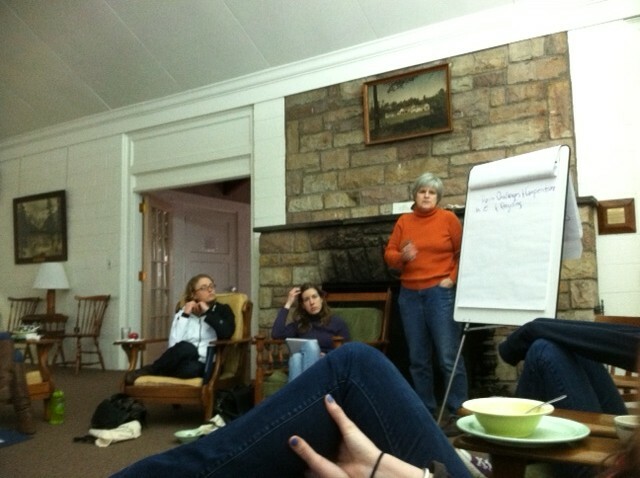 I will attached the weblink for anyone who wants more specifics on the retreat conversation and discussion. 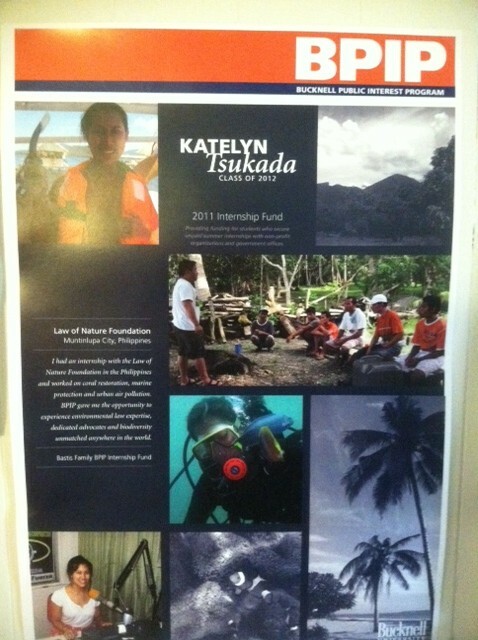 This past summer I received funding for my Philippines internship through the Bucknell Public Interest Fund or BPIP. The fund provides a stipend of $2,500 for students who secure an unpaid internship with a non-profit organization or government. The program was originally based on similar funds at other universities and provides students with the means to partake in valuable internship opportunities that lack financial compensation. On October 22, there was a BPIP Breakfast held where all recipients and donors were invited to attend. I saw a number of posters detailing other incredible internship experiences of students who had worked with children diagnosed with cancer, taught English in India, or raised money for a girls school in Africa. Here is my poster! Thinking back on my last three year at college, Bucknell has provided me with the resources to experience amazing things. I wouldn’t have been able to live in Washington, D.C. and work with the Environmental Law Institute or travel across the Philippines working with environmental initiatives if the BPIP fund did not exist. Last fall, I studied for an entire semester in Denmark and this spring break I will be going to the Dominican Republic with a Bucknell service group called A.C.E.S. And these accomplishment are not unlike many Bucknell students. So many of my friends have taken advantage of even more opportunities to broaden their horizons and positively change people’s lives. Yesterday, as I donated to the Senior Gift Drive, I thought about the personal growth I had experience since my time at college. I thought about the clubs I joined, the classes I took and the friends I made. The future is uncertain and my 5-year plan is foggy as a November morning. But I value every part of my “liberal arts education” for shaping the person I am today. Oh, and you can read my BPIP Spotlight here! 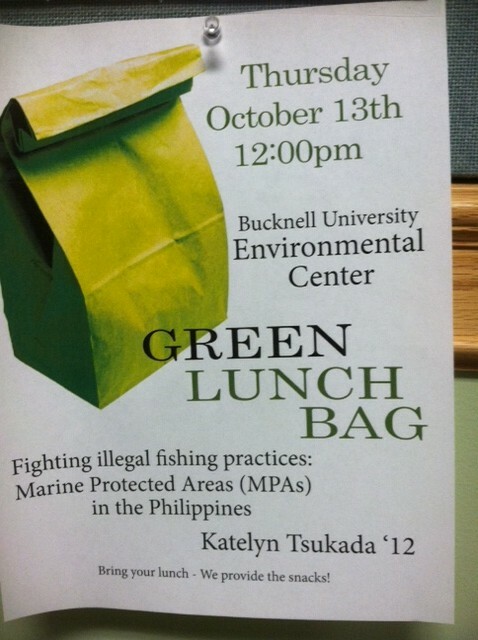 Today at noon in the Environmental Center, there will be a talk on Marine Protected Areas in the Philippines. Funny, you might think. That is exactly what Katelyn did during her summer internship.Well…the speaker is me. I even have an attractive looking poster. Getting the chance to talk about my incredible experience while educating people on the value of protecting oceans around the world? I don’t know what could be better. Making the PowerPoint last night (Prezi is complicated), waves of memories washed over me. The palm trees. Scuba diving. Hot sun and humid nights. The pictures and e-mails with friends are the only concrete evidence I have that the Philippines wasn’t a dream. 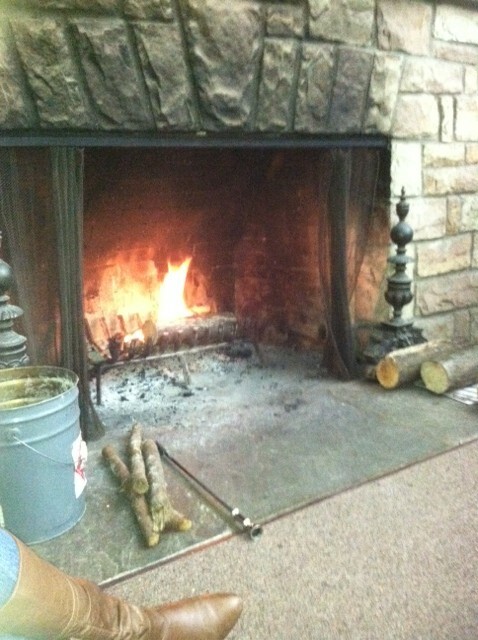 So if you’re in Lewisburg, PA at 12 noon you know where you should be.